Whether it is farm to table or field to fork, Americans have options when it comes to the food we eat. Options that provide us with unparalleled variety and access to the lowest cost food in the world. Every day, constant innovation and advancements in technology are making it easier and more affordable for Americans to access the food our families need to stay happy and healthy. America’s farmers and ranchers are feeding more people with fewer resources than ever before and are making conscious decisions to keep agriculture sustainable for generations to come. None of this is by accident. Our nation’s food security depends on strong agricultural policy that provides stability for America’s farmers and ranchers; protects our land and natural resources; develops new trade opportunities while leveling the playing field for our producers; strengthens rural communities; and helps Americans of all stripes access the nutritious foods they need to keep their families healthy. This is America’s food policy. This is the Farm Bill. The current Farm Bill expires in September 2018 and work on the next Farm Bill is underway in Congress. According to The National Wildlife Federation, “The Farm Bill is one of the most important federal policies affecting conservation and wildlife habitat. It offers the single largest source of funding for conservation on private lands.” Read more HERE. Listen to Episode 16, the newest Conservation Federation Podcast and learn more about The Farm Bill. CFM Executive Director Brandon Butler interviews Missouri Prairie Foundation President, Dale Blevins and Executive Director, Carol Davit. 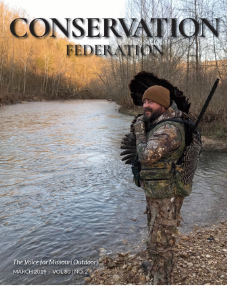 Read the current issue of Conservation Federation. On page 41 of the May Issue is the article “Voice Support for Robust Conservation Measures in 2018 Farm Bill.